When we moved to Ohio nine years ago, I left behind a number of things: family, the Wasatch, and lungs accustomed to the altitude and burn of flying up and down trails on foot and wheel. When we arrived in Ohio, I was so busy getting used to a new home, law school, new friends, a new city, and new trails, restaurants, and shops that there wasn’t much time to miss the Wasatch. We visited Salt Lake at least yearly, but the few-days-to-a-week-long jaunts were a whirlwind of seeing parents, siblings, and friends, leaving little time to venture outdoors and explore the areas that we grew up visiting. Deciding to return to Salt Lake City was an emotional cocktail of apprehension and excitement–we loved Ohio, realized that Utah posed unique challenges, but were excited to be back amongst family and the Wasatch. We moved to a neighborhood where I’ve always wanted to live, providing instant access to Emigration Canyon, and few-minutes access to Millcreek, Big Cottonwood, and Little Cottonwood Canyons. I knew it was good to be back the first time I huffed my way up Emigration Canyon–it was exciting to have such an ideal training ride right out my front door. Proximity to the Wasatch eventually erased any misgivings I harbored about living in Salt Lake City again. I always enjoyed the Wasatch, but I under-appreciated them until I returned to their shadow. My absence cultivated a profound gratitude for their presence, an appreciation for their magnificence, and a strong desire for their protection. There are many things that make Utah unique, but its rugged places make Utah pleasantly unique. Although we have now lived here for over three years, I remain smitten by the magnificence of Mount Olympus every time I venture to my dining room or hop in the car. How many people have a view like this from their home? Getting There: Take I-215 East, Exit at 4500 South, and head south on Wasatch Boulevard until you see the trailhead/parking lot on the east side of the road (approximately 5400 South). Get out of the car and climb straight up the mountain! The easiest way to catch the trail is via the south end of the parking lot, something we could not see at our 4:00 am start time. Instead, we scrambled up the side of Pete’s Rock. Either route will get you to the same place, and neither is particularly level, but skip the Pete’s Rock scramble. Hiking Distance/Time: 3.2 miles one way. Between breaks to adjust yet-to-be-broken-in boots (I optimistically–and incorrectly–thought carrying 40+ pounds worth of my two youngest kids on hikes in Zion the week before would be enough break-in), to catch sunrise pictures, etc., we took our time hiking up, and we hit the summitt in 3 hours 15 minutes (moving time was closer to 2 hours 45 minutes). After about an hour at the summit, the trip down (brutal on the knees and quads at this age, this early in the season) took 2 hours 30 minutes on a crowded trail. Elevation Gain: Approximately 4250 vertical feet (roughly 1,356 vertical feet per linear mile, beginning at around 4,800 feet and topping out at 9,026 feet). That elevation gain is the equivalent of climbing from street level to the observation deck of the Empire State Building over 3 and 1/2 times. Difficulty: Strenuous (on a scale of weak, moderate, and strenuous). Salt Lake and Utah Counties only offer a handful of steeper hikes (including the more challenging Neff’s Canyon route to the summit–a whopping 1,939 vertical feet per linear mile and the steepest trail in Salt Lake and Utah Counties). Regardless of your level of conditioning, you will find this trail to offer excellent exercise, and your fatigued legs will probably curse the stairs at the bottom of the trail as you return. This is not a hike for young children (it would probably be irresponsible to bring children given a few areas of light bouldering and minimal exposure)–people have become stranded and died on this mountain. But, for well-prepared 10 year olds and older, the trail is definitely doable (infinitely more so for teens than for my aging knees!). Beauty Quotient: Inspiring. You will see Utah Lake, the Great Salt Lake, Lone Peak, Twin Peaks (Broads Fork), the Lake Blanche drainage, Granduer Peak, the Oquirrh Range, Deseret Peak, and the expanse of the Salt Lake Valley from end to end. The views are spectacular in all directions–I mean look at this panorama! Solitude Quotient: Busy. 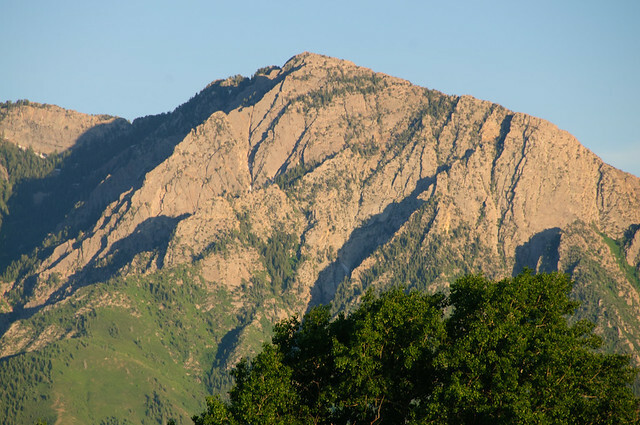 This is one of the more popular hikes in the Wasatch, and for good reason. Most people on the lower trail are not aiming for the summit, but the summit is large enough to accommodate plenty of people. We only saw a few people on our way up at 4:00 am, but the trail was very busy as we returned. If you want solitude, you should find another trail unless you summit during non-peak hours. Regardless of the crowds, the views are magnificent and worth bumping elbows. Take, for instance, the view to the south: the majestic Twin Peaks (Broads Fork), Lone Peak, and others provide a view of just how rugged the Wasatch mountains are. My Take: This is a great trail, ranging from desert to high alpine vegetation. The first one-and-a-half to two miles are pleasant, then the trail steepens considerably. I will not give full route details here (there are plenty of trail guides available on the interwebs)–just know that once you’re on the trail, follow it until it ends (the trail will take you to the South Summit, the higher of the two summits comprising Mount Olympus). There are a few places where you might feel like you are taking a wrong turn–if you find something too exposed, back up and look for another route. Upon reaching the saddle, there is one way to the top, and that is about 2/10ths of a mile straight up the rocks. Wear sturdy shoes with good grip, because, to paraphrase something I read somewhere else, the rock is very slick when dry, and would be murderously slippery when wet. As with almost every other hike I have been on, the up-hike is much better than the down-hike. The steep trail and many rocks will entertain young legs and test not-so-young legs. This was my first time using trekking poles, and while not necessary on this trail they certainly helped with the ascent and descent–especially the last mile or so when my quads and knee were spent. I plan to hike Mount Olympus again this summer, and I’m certain the experience will be less pain-inducing when better conditioned. This is a trail on the south side of the mountain, so be prepared to bake in the sun. We left at 4:00 am in part due to time constraints and in part due to the forecasted 90+ degree weather, and we were glad to miss the heat of the day. Plus, the sunrise was fantastic. I brought a gallon of water and drank about 3 litres. There are no reliable sources of water on this hike (a seasonal, low-volume stream only), so you need to take plenty of water. I was amazed at how many people on their way up were nearly out of water only 1.5 miles into the 6+ mile hike. While not everyone on the lower trail plans on summiting, we ran into a group who were very grateful for the last litre of my water (they still had 4.5 miles of hiking in front of them if they reached the summit as they planned!). Even at 4:00 am, the 65 degree weather was plenty warm, and it was downright hot the whole way down (I would not start this trail any later than 6:00 am in the heat of the summer). Where else can you drive 15 minutes from the city and find a 3 mile trail with 4,000+ feet of vertical?! We are lucky to live in Salt Lake City–the opportunities are endless. Finally, a note about stewardship. Please stay on the trail–short-cutting switchbacks is a huge problem on this mountain. Also, to whoever leaves bottles, cans, and other garbage and paints graffiti on the rocks (we found spray paint as high as the saddle! ), get a life. The Mount Olympus wilderness is not your trash can. We packed out some garbage left behind by others (the slobs always depress me)–please pitch in and do your part, and please remember to Leave No Trace. 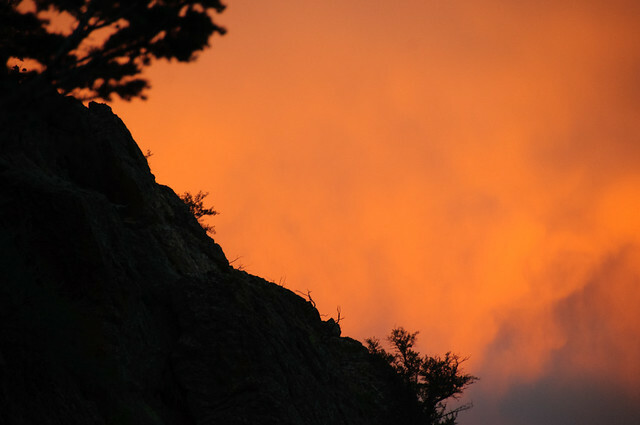 Let’s preserve the Wasatch’s beauty for your kids and mine. Any questions about the hike? Feel free to leave a comment or contact me. Check out the other pictures here.